All routes described in the schedule above are open for individual booking. You can choose for double or single occupancy of the cabin. Our planning is based on the situation in December 2016. It is possible that we have to change these routes during the year 2018. Always check with us to see if there are any changes in these routes. During the winter period it is possible to book a cabin with breakfast. 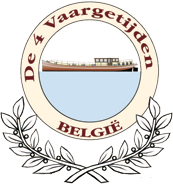 “De 4 Vaargetijden” is moored in the city centre of Oudenaarde. Within 30 minutes you travel to Ghent & Bruges! Price: 75 €/per cabin, breakfast included.